The article was written to address the producing of parts by owner and operators. The article is not intended to imply that maintenance technicians or repair stations may not be able to manufacture parts in the course of accomplishing repairs or alterations. That in itself is another topic for another day. The sun was setting on another hot August afternoon when the South Carolina Flight Standards District Office received the call from a local airport manager notifying the office that a Piper Cherokee had suffered a nose gear collapse during taxi operations. It was reported that the Cherokee suffered minor damage; the damage included a prop strike and lower cowling abrasion. Early the next morning, the inspector assigned to investigate the incident picked up the preliminary information with one hand and his first cup of coffee with the other. As the aroma and warm flavor of his coffee cleared the night�s cobwebs from his mind, he eyeballed the incident information. As he read, he thought: "Let�s see, Cherokee 140, taxi, nose gear collapse, prop, cowling, etc., etc.wait a minute, Cherokee 140? How can a 140�s nose gear collapse during taxi operations and cause this kind of damage? An Arrow, maybe, but a 140?" Years of experience told the inspector there was a lot more to this story than had been reported. So on that hot, humid, August morning, he headed for the airport. His investigation uncovered a classic case of an aircraft owner making parts and doing everything wrong. The issues surrounding manufacturing approved parts, who can produce these parts, what makes a part approved or unapproved, all came up in the investigation. Time and again aircraft owners and maintenance technicians are pressured into making parts. Why do we do it? Why do we take on that liability? Let�s look at the facts. The average general aviation, piston single-engine aircraft is more than 32 years old; the average piston twin is more than 27 years old; and the average turbo prop is 19 years old. The GA aircraft fleet was never designed to last this long, and, when it comes to getting replacement parts to maintain these aircraft, here are a few of the problems we all face. The aircraft has been out of production for years. The aircraft is an orphan. No one even knows who owns the Type Certificate. There is no technical support. If you ask for technical assistance, you are often told that no one really knows much about the aircraft anymore. The people who were around when the aircraft was built are all retired or dead. Economy of scale forces aircraft manufacturers to build parts in quantities that make economic sense for the manufacturer. What this means is that parts are available, in about six or eight months! The price of parts is a subject that we aren�t even going to talk about. Sitting in the middle, between a tired broken airplane, its owner, and all these parts problems, is the maintenance technician. Technicians, by their nature, are "can do" people. They live by the motto the difficult we do immediately; the impossible just takes a bit longer. But when it comes to making parts, this "can do" philosophy can really get them in trouble. Let�s examine the rules governing the general privileges and limitations of a maintenance technician (or certificated mechanic as stated in FAR §65.81), and the rule governing a repair station�s privileges of certificates (FAR §145.51). Under both rules a technician or repair station may perform maintenance, preventative maintenance, and alterations on an aircraft, or appliances for which he is rated. Nowhere in either rule does it say that the maintenance technician or repair station can produce new parts! However, the maintenance regulations allow the manufacture of parts for repair (see number 11 in next question. A maintenance tech or repair station can make patch plates, reinforcement splices, and incorporate them into the repair of a part. But again, a, a maintenance technician cannot make a brand new part for sale. Here are some answers to those earlier questions. Question: who can make a brand new part? 7. Any method acceptable to the Administrator. 10. Parts produced per STC instructions as part of an STC modification. 11. Fabricated by a qualified person in the course of a repair for the purpose of returning a TC product to service (which is not for sale as a separate part) under part 43. All this sounds like bureaucratic alphabet soup, but, of all the ways listed, "Owner Produced Parts" is the one most misunderstood. FAR §21.303(b)2 makes a provision for an aircraft owner or operator to produce parts for maintaining or altering his or her own product. Under this provision, the Owner Produced Part can only be installed in an aircraft owned or operated by that person and the Owner Produced Part cannot be produced for sale to others. Question: How is it that an aircraft owner can produce a part, but a skilled maintenance technician can�t? Question: How does this owner-produced rule work? Does the owner have to make the part himself? A part does not have to be solely produced by the owner to be considered an Owner Produced Part. The aircraft owner must participate in the manufacture of the part in at least one of five ways for it to be considered an Owner Produced Part. 1. The owner provides the manufacturer of the part with the design or performance data. 2. The owner provides the manufacturer of the part with the materials. 3. The owner provides the manufacturer with fabrication processes or assembly methods. 4. The owner provides the manufacturer of the part with quality control procedures. 5. The owner personally supervises the manufacture of the new part. As anyone can see, the discriminators for determining owner participation in a new part�s manufacture are very specific in the interpretation. Attachment (A) to the 1993 Memorandum clearly stipulates that the FAA would not construe the ordering of a part as participating in controlling the design, manufacture, or quality of a part. The key point is that the aircraft owner must participate in the part�s manufacture. Question: If the part is owner produced, is it also a FAA approved part? Can I install it in the owner�s aircraft? Answer: If the Owner Produced Part has all the characteristics of an approved part, is only installed on the owner�s aircraft, and is not for sale, it would be considered a FAA approved part. Drawings, specifications to define the part�s configuration and design features. Information on dimensions, materials, and processes necessary to define the structural strength of the product. Airworthiness limitations and instructions for continued airworthiness. Any other data necessary to allow by comparison, the determination of airworthiness of later products of the same type. The part complies with all applicable structural requirements of its design. The materials and products conform to the specifications in the design. The part conforms to the drawings in the design. The manufacturing processes, construction, and assembly of the part conform to those specified in the design. 3. The part�s production should be properly documented. A properly documented part provides evidence that the part was produced under an FAA approval and memorializes the production of the part. 4. The part must be properly maintained. A properly maintained part means that the part is maintained in accordance with the rules prescribed under FAR Part 43. It is relatively easy for a part to meet the requirements of the August 5, 1993, Memorandum and qualify as an Owner Produced Part. The four characteristics of an approved part are like the four legs of a table with all four legs "equally sharing" the burden of an approved part. If one leg is missing, the table will fall over. In the same way, if any of the four characteristics of an approved part is missing, then the part may not be FAA approved. The original factory nose strut lower tube was pitted. The aircraft owner had a strut tube locally manufactured. A technician who knew of the part�s origin installed the strut tube. The strut tube failed during the first operation, resulting in $7,000+ in damages. Question: Was the strut-tube an Owner Produced Part? Question: Was this a FAA approved part? Answer: No, the part was not approved because the owner did not provide the manufacturer with an approved design or its equivalent. The part was not approved because it did not conform to the material specifications prescribed in the approved design. The part failed during its first operation and didn�t last long enough for maintenance to be a factor. Question: Did the part producer (aircraft owner) or the maintenance technician who installed the strut-tube violate the FAR? Who should be held accountable? Answer: The answer is both! The maintenance technician violated the rule the moment that he signed the maintenance records and approved the aircraft to return to service with the knowledge the part he installed was unapproved, that is he apparently understood that the part was produced by the owner. 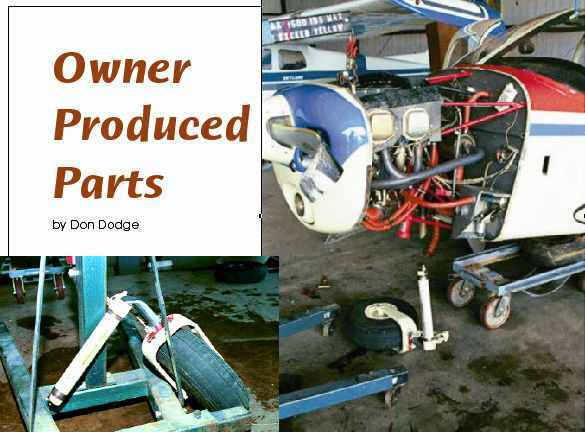 The question he should have asked the owner was "how the part was produced so as to meet the performance rules of part 43.13 of the Federal Aviation Regulations." The aircraft owner violated the rule when he knowingly operated the aircraft with an unapproved and undocumented part installed. Question: This incident with the Cherokee 140 was wasteful, tragic, and dangerous. If the aircraft owner wanted to make an Owner Produced Part, what should he have done? The owner should have used the original manufacture�s prints and specifications (FAA approved design). It would have saved him time, money, and maybe his life. Reverse engineer to develop a design if you must, but do your research and submit the resulting design to the FAA for approval. Depending on the complexity of the part, reverse engineering may result in a new design. This design is the aircraft owner�s, not the original manufacturer�s, and is not automatically FAA approved. The finished part must still meet the requirements of the performance rules of section 43.13. Always contact your local FSDO for guidance. Produce the new part to conform to the approved design. Nothing more, nothing less. Stronger is not always better. The aircraft owner (part�s producer) or the technician who installs the part should document or memorialize the production of the part in the aircraft records. It would be wise if the installing technician requires the part producer (aircraft owner) to memorialize the parts production in the aircraft records with a statement worded in a similar form as the one below, on this page. After the part producer memorializes its production. The installing technician must make a maintenance record entry indicating that he or she installed the part. After all, installing the Owner Produced Part is a maintenance function. Aircraft owners can perform preventative maintenance, but not maintenance. A maintenance technician can repair a part, but sometimes the distinction between repairing a part and producing a brand new part is hard to determine. The circumstances surrounding the repair, the part�s complexity, availability of manufacturer�s data, and industry practices all are determining factors. For a lack of a better term I call making this determination the "Test of Reasonableness." Example Scenario: An aircraft wing is damaged. The damaged parts include a wing rib, a 24-inch stringer, and wing skin. The aircraft Structural Repair Manual provides material specifications for the skin and stringer. A new wing rib is purchased from the aircraft manufacturer and the technician fabricates a stringer and wing skin using the damaged parts as a template. The technician installs these parts and repairs the wing in accordance with the manufacturer�s instructions. The material specifications were published and readily available. The parts were simple and the fabrication processes for the parts involved common tools, skills, and standard industry practices. Templates for the reliable reproduction of the parts were available (Design). The parts were incorporated into a repair in accordance with the manufacturer�s instructions. In this case, the "Test of Reasonableness" would determine this to be considered a repair, even though the technician did fabricate a stringer and skin. Maintenance technicians must face a cold hard fact. Aircraft owners can make parts, but they cannot install them. Installing Owner Produced Parts is a maintenance function and only technicians can do that. That makes technicians the "gatekeepers" for parts and guardians against the introduction of substandard and unapproved parts into the fleet. Under this rule the responsibility is the technician�s to determine airworthiness before returning the product to service. There is no one else to shift the burden of blame to. The technician�s name is on the blame line. Under the Federal aviation regulations, aircraft owners can produce a brand new part for their aircraft; technicians and repair stations can�t. For a part to be considered "owner produced," the owner must have participated in its manufacture in at least one of the five ways prescribed in the 1993, Memorandum. An Owner Produced Part must have all four characteristics of an approved part before it is considered a FAA approved part and eligible for installation. Sometimes the distinction between producing a new part and making a repair is hard to determine. When in doubt call the local FSDO and ask for guidance. Maintenance technicians are the gatekeepers for parts entering service in the fleet. Technicians bear the lion�s share of the responsibility. The technician�s name is on the blame line. The availability of parts is a constant problem with our aging general aviation fleet. As time passes, Owner Produced Parts may be the only alternative available for maintaining some of it. With the passage of time, technicians are going to be increasingly forced to face the challenge of determining the airworthiness of Owner Produced Parts. There are five points summarized here. Remember the five and stay alive! Don Dodge is the Airworthiness Safety Program Manager at the South Carolina FSDO.